Energems is a chocolate candy coated energy supplement. They are easy to eat-no after taste or weird. They pretty much remind me of large M&M's(no they are not made by M&M's). Energems are made in the U.S.A. They are made with high quality milk chocolate that is produced in Chicago. 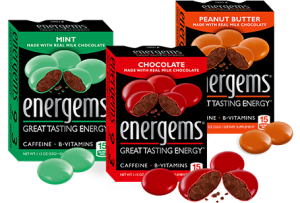 Energems are bite-sized, energy supplements in the form of a hard coated gem made with real milk chocolate, caffeine, B-vitamins and a proprietary energy blend.